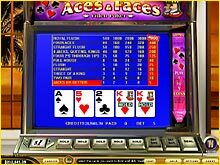 Aces&Faces is played almost the same as Jacks or Better. The difference is in the payout table. Payouts are higher in this game for 4 of a kind payouts of Aces and Face cards. The game uses a standard 52 card deck. There are no wild cards in Aces & Faces.